In 2018, as America and the world mark the 50th anniversary of the death of Martin Luther King Jr., Virginia Arts Festival will present the internationally acclaimed play, L.A. Theatre Works: The Mountaintop, written by Katori Hall. Directed by multiple award-winner Shirley Jo Finney and starring Gilbert Glenn Brown (CBS’s The Inspectors, upcoming feature film The Best of Enemies) and Karen Malina White (The Cosby Show, A Different World, Malcolm and Eddie) the L.A. Theatre Works production will travel to 38 cities across the United States. 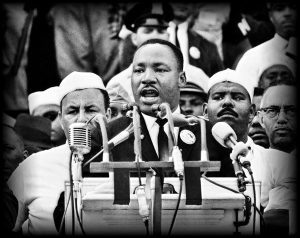 On the evening of April 4, 1968, only a few hours after his famed “Mountaintop” speech, Martin Luther King Jr. was murdered outside room 306 of the Lorraine Motel in Memphis. In The Mountaintop, Hall fantasizes what may have transpired inside that room before the assassination. Recipient of London’s 2010 Olivier Award for Best New Play, Hall’s gripping re-imagining of events is rife with humanity and humor as the celebrated Reverend reveals his hopes, regrets and fears to a seemingly inconsequential hotel maid. The Mountaintop premiered in London at Theatre 503 before transferring to Trafalgar Studios in the West End where it won the Olivier Award for Best New Play. The 2011 Broadway production starred Samuel L. Jackson and Angela Bassett. The Mountaintop contains some mature language. For three decades, L.A. Theatre Works has been the leading radio theater company in the United States, committed to using innovative technologies to preserve and promote significant works of dramatic literature and bringing live theater into the homes of millions. The company’s public radio series, featuring stage plays performed by America’s top actors augmented by interviews with the artists and others, can be heard on public radio stations across the U.S.; daily in China and around the world on the Radio Beijing Network; can be downloaded as a podcast via iTunes and Wondery.com; and can be streamed on demand at www.latw.org. Tickets are available online at www.vafest.org, by phone at (757) 282-2822 or by visiting the Virginia Arts Festival box office located at 440 Bank Street in Norfolk between 10 a.m. and 5 p.m., Monday-Friday.